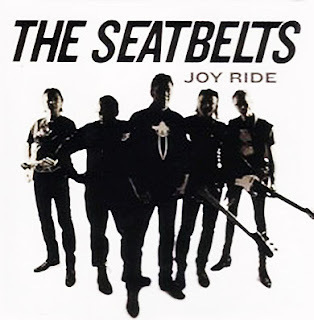 RETRO KIMMER'S BLOG: I94 BARMAN REVIEWS JOYRIDE BY THE DETROIT SEATBELTS! I94 BARMAN REVIEWS JOYRIDE BY THE DETROIT SEATBELTS! So sorry.... I am not a music reviewer naturally...I like what I like and basically all I can say is I LOVE THE SEATBELTS. What is it about Michigan rock bands releasing debut albums 30 years after they were regularly working the live circuit? The Ramrods did it a few years back and The Seatbelts, now well and truly reformed, continue in the same vein. Contemporaries of of the similarly non-prolific Sonic's Rendezvous Band, they've unleashed "Joy Ride" onto an unsuspecting public with rock and roll seemingly in its death throes. Maybe, just in the nick of time. This is a 13-song trip down Interstate 94 that ignores the pot holes. It's straight-up rock and roll with its roots in the '50s. Greg Upshur is a rock and roll singer in the truest sense of the term - vocally he's recalling Robert Gordon. Guitarists Rick Mills and Chris Flanagan favour clean tones without gloss or sheen. If the band wore collars they'd be blue - just as it tends to be with real rockers from the Motor City and environs. Those muscle car mentions in "Age Group Rocker" are entirely appropriate.